Born in Moscow, into a multilingual family of three generations of renowned linguists. Personally trained in English language and translation skills by E. E. Israilevich, one of the founders and professor at the Academy of Foreign Trade of the USSR, the well-known linguist, scholar and author of the first English grammar textbook published in the USSR. Master's degree in architecture. American citizen; living in San Francisco since 1987. Twenty five years in translation for a variety of topics for government, corporate, and private clients. Certified translation of academic records and legal and business documents; linguistic analysis of company and product names; localization and cultural adjustment of marketing materials. Published author of literary and legal translations from Russian and English. Twenty years of experience interpreting for depositions, arbitration and trials in criminal and civil courts, including business, intellectual property and real estate disputes, divorce, adoptions, personal injury, workers' compensation. Provided services to The Hague Permanent Court of Arbitration, The London Court of International Arbitration, U.S. Federal Court, Superior Court of California, INS/USCIS, San Francisco District Attorney's and Public Defender's Offices, and major national and international law firms. Classroom interpreter for USAID and USIA educational programs. 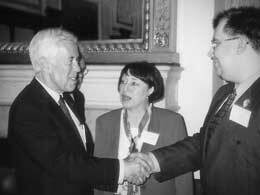 Delegation interpreter for Russian business leaders in meetings with Secretary of State Colin Powell and members of the U.S. Senate and Congress, including Richard Lugar, Diane Feinstein, Barbara Boxer, Richard Gephardt, and others. Interpreted for world-famous musician Mstislav Rostropovich, poet Yevgeny Yevtushenko, and many other high-profile political and cultural figures. Program coordinator and group facilitator for educational programs sponsored by USAID and USIA, Bureau of Educational & Cultural Affairs, U.S. Department of State, Center for International Studies at California State University, Kaiser Permanente International, Asia Foundation, Earth Island Institute, and others. Department Manager, Translation and Cross-cultural Communication Department for USAID sponsored program providing business management training to new Russian entrepreneurs. Assistant Director for International Programs, Climate of Trust, a Russian-American program for legal professionals and public officials designed to combat hate crime and promote ethnic and religious tolerance. Office of the Attorney General, California Department of Justice: assisting attorneys and experts in preparing, reviewing and analyzing documents used in investigation and litigation involving the electricity and natural gas market in California. Other projects included assisting in researching and translating into English of a large volume of historical and legal documents concerning the history of foreign concessions in Russia.